During June of '44, the Roseborough Replacement Crew ferried over a B-24 using the northern route. After arriving to the UK they were initially assigned to the 491st, but their orders were changed to the 492nd since it had substained heavy losses on 20 Jun 44. The Roseborough Crew were assigned to the 859th BS on the 24th. The Group had just done away with the 858th BS, sending its men and ships to the other three squadrons. The consolidation plan increased each squadron's size from 18 crews to 22. The Roseborough Crew was designated as Crew 919. With very little in-house training they began flying combat missions five days later. All records and historians agree that the Roseborough Crew flew 16 missions plus an aborted one with the 492nd. We believe that there were no substitutions made on any of their flights. We are told that the Crew stayed together throughout their service in the war. 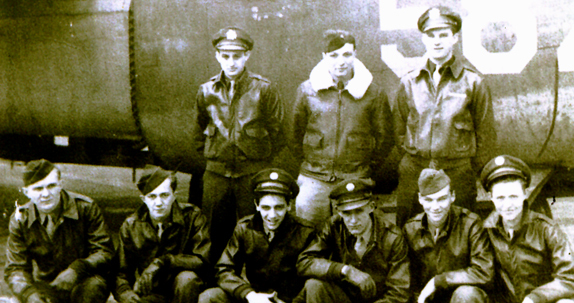 On 10 Aug 44, when the 492nd was disbanded, they were transferred to the 467th BG, 788th BS. They flew another 19 missions with them plus a number of "trucking missions" that supplied the advancing ground forces (Patton) with much needed supplies. By the war's end they had 35 credited combat missions and the entire crew returned home safely.